The United Nations Children’s Fund (UNICEF) said over 57 per cent of schools in Borno remained closed, in spite the new school year, due to the Boko Haram insurgency in North-East Nigeria. A statement signed by UNICEF, Abuja, Chief of Communications, Ms Doune Porter, on Friday says as a result, an estimated three million children were in need of emergency education support. “Since 2009, across the North-East, over 2,295 teachers have been killed and 19,000 displaced. “Almost 1,400 schools have been destroyed with the majority unable to open because of extensive damage or because they are in areas that remain unsafe, “ Porter. Porter quoted the Deputy Executive Director, UNICEF, Mr Justin Forsyth, who said, “Children in North-East Nigeria are living through so much horror. She, however, stated that UNICEF was working with partners to rehabilitate schools as well as training teachers, to build a stronger education system for the future. According to Porter, some children living in camps for the displaced in Borno are actually benefiting from education for the first time in their lives. “In the Muna Garage camp on the outskirts of Maiduguri, for example, an estimated 90 per cent of students are enrolled in school for the first time. “In the three most-affected states of North-East Nigeria, UNICEF and partners have enrolled nearly 750,000 children in school this year. “Also, we are establishing over 350 temporary learning spaces, and distributing almost 94,000 packs of learning materials that will help children to get education, “ she said. 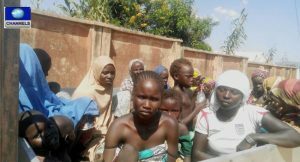 “The use of children as human bombs, close to 100 so far in 2017, has sown a climate of mistrust among communities in the North-East. According to her, UNICEF’s life-saving emergency programmes in the region, however, remains underfunded. The Chief of Communications noted that with only three months left in the year, UNICEF had a 40 per cent finding gap in its needs for 2017.